This summer my mom expressed interest in getting a bicycle. She does a lot of short (sub 3 km) runs in her car that could easily be accomplished on a bike. But easy is a relative term. She's approaching 70, smokes, isn't in the greatest shape and hasn't been on a bike for 25 years. Picked one up yesterday. I used it today to make sure it was in good working order because it needed to be "modified" to fit her better - by lopping an inch off the seat post and an inch off the seat tube. Can't return it now! Modest specs: 24v lead-acid, 200w hub motor. Top speed under electric power: 20 km/h. Top speed under pedal power: about 20 km/h - because it's a single speed and geared fairly low. It's advertised as having a 20 km range with "assisted pedalling". I rode it 24 km today using mild to medium assist (to put it in perspective: it was a hot, humid day here - low 30's C/90's F - and I didn't break a sweat), and only used about 50% of its capacity based on DMM readings. Probably averaged 15 km/h. Mom hasn't tried the electric assist yet. She's taking it easy getting re-familiarized with the whole balance thing, just going up and down the sidewalk, and in & out of her driveway. At her request I also bought a honking big basket to mount on the built-in rear rack. Neat bike - I wouldn't have one personally because it's a single-speed. But she likes the simplicity. And being a hybrid, she'll be able to compensate for those times the single gear isn't appropriate for the conditions/terrain, or if she doesn't feel like pedalling. I opened the battery box out of curiousity: 2x 12v 12AH (@20H) valve regulated sealed lead acid batteries. EDIT: it's odd that these specs aren't in any of the product literature or manuals. Dropped by the parents' this evening and mom was out again "practicing". She's really being very sensible about it, for not having ridden for 25 years. She says: "I want to practice riding slowly because it helps me re-learn my balance. It's easy to ride quickly." Unfortunately, since she had expressed no interest in using the e-assist up to now, I hadn't yet shown her how to turn it on or use the throttle, and she said she would have tried it today on a little hill she encountered. But she knows how it works now. My dad on the other hand just treats it like a scooter. No point in pedalling it if he can just twist the throttle. Sorta like my 9 year-old nephew! Featuring everyone's favourite EV proponent: Ed Begley Jr! Man I kind of like that. How do you think it would hold up under moderate to heavy use? Now that your an EV expert how do you think the batteries would hold up with about 15 miles a day on um? And he's apparently ridden it more than 5000 km (3k mi.) and is still on the original batts. But his is 36v, and has a 500w motor. And I'd say that for regular use, you'd be better off with that those specs (for longevity) than the 24v/250w on my mom's bike. I think eBikes are a great alternative to cars for people whose commutes are bike friendy. 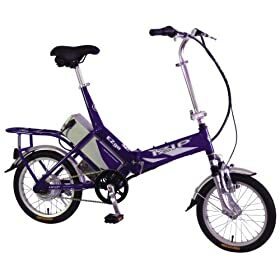 I just found out a the husband of a friend of mine got an ebike. Interesting story: he teaches a course about climate change at UBC, and used to drive a Civic to campus. But as their family grew, they got a minivan. At which point he said: "I'm not commuting in that!" so he got a BionX li-ion ebike kit and that's how he commutes now, rain or shine. So, four years of light use later, the battery pack in this bike has given up the ghost. Power output from the motor is low, and the "fuel gauge" LED's on the twist throttle show "empty" under anything but the lightest amount of assist. Also, the charger will show "green" (charged) indicator almost immediately after plugging it in, which isn't normal. One of the pair is dead. The other still has about 2/3 of its rated capacity, after doing a simple capacity test using a 12v DC/AC inverter. It's ~130 bucks to replace the entire pack assembly, the store says. The spade connectors on the wiring were soldered to the battery tabs. The workaround is to monitor the battery voltage of the older battery, and ensure it's not drawn below the magic number of 10.5 volts under load. Below that voltage (1.75v per cell), a lead acid battery can be quickly, irreversably damaged.